But do these bonuses really make employees more loyal? If you’re hiring a new candidate, a sure way to sell them on a job is with a signing bonus. And one industry that’s got this down is technology. 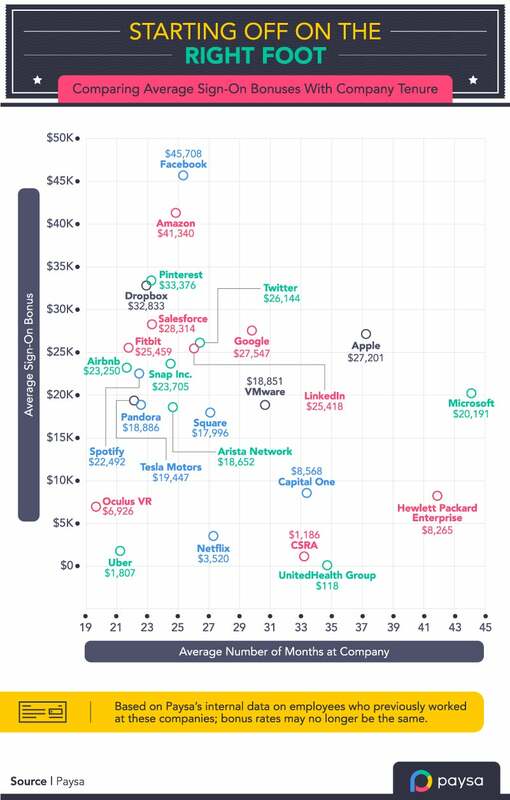 Some of today’s top tech companies offer candidates some major signing bonuses. However, do these bonuses actually increase employee loyalty? Taking a look at bonuses and employee retention rates of major tech firms such as Facebook, LinkedIn and Amazon, a recent study by online career adviser Paysa sought to uncover how well these bonuses really work. Turns out, while a signing bonus can be a great tool to recruit new employees, it might not be enough to keep them around for long. Facebook offered employees an average signing bonus of more than $45,000, however, the typical tenure of these new employees was just over two years. The case is similar for ecommerce giant Amazon, whose average signing bonus for employees is $41,340, yet these people only tended to stay at the company for barely two years. So, what’s the sweet spot for offering a signing bonus that will make employees want to stick around? According to the research, employees had the longest average tenure at Microsoft -- around three and a half years -- and were getting an average signing bonus of $20,191. To learn more, click through the slideshow to find out the 15 tech firms with the highest signing bonuses. While it’s many people’s dream to work at the social media giant, it turns out that once people are hired they don’t tend to stick around. On average, new employees receive a $45,708 signing bonus, but only stay at the company for an average of 25 months. Snap Inc. offers employees an average $23,705 signing bonus, and the average employee retention rate is about 24 months. Coming in second for the highest signing bonus is ecommerce giant Amazon, which usually offers employees $41,340. Yet, the typical tenure of these new employees is also around 25 months. Pinterest might attract new recruits with its average $33,376 signing bonus, but that’s not enough to keep them around for long. Employees usually stay there for a little more than 23 months. You might think $32,833 for a signing bonus would do the trick to increase employee loyalty, but Dropbox employees tend to stay less than 23 months. On average, Salesforce has a 23-month retention rate, even when it offers its new employees a signing bonus of $28,314. Turns out, free meals, nap rooms and on-site massages might just do the trick. At Google, the average employee retention rate is 30 months and its average signing bonus is $27,547. When it comes to employee loyalty, looks like Apple is doing something right. Employees typically stay more than 37 months and the average signing bonus is $27,201. Twitter gives its new employees an average $26,144 signing bonus, but employees only tend to stick around for about 26 months. The wearables brand offers its employees a pretty hefty signing bonus of $25,459. It doesn’t seem to have too much of an influence -- on average, employees stay for just 24 months. Similar to Fitbit, LinkedIn offers its new employees a $25,418 signing bonus. Employees usually stay for 26 months. A signing bonus of $23,250 doesn’t seem to have much effect on employees at Airbnb. These people don’t even tend to stay for two years, and in fact, average around 21 months instead. Like Airbnb, Spotify’s $22,492 signing bonus isn’t enough to get employees to stay for at least two years. On average, Spotify employees stay 22 months at the company. Microsoft seems to have struck the perfect balance between signing bonus and employee loyalty. By offering new employees $20,191, they average a 44-month employee retention rate -- that’s three and a half years. Elon Musk’s Tesla has a generous signing bonus of $19,446. However, employees only stay an average 22 months.